Paradiso Boutique Suites is located on Sukhumvit 10 Road and offers stylish accommodation with easy access to transportation links and the business and commercial districts. 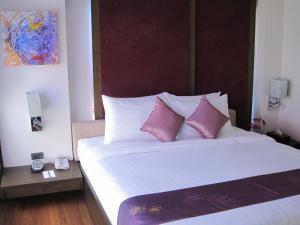 Situated in Sukhumvit, it is close to a number of shopping centres, eateries, entertainment and nightlife options. Sukhumvit MRT station and Asoke Skytrain station are also within easy reach, making travelling around the city easy. Rooms at Paradiso Boutique Suites are contemporary in design and are furnished with amenities that include a 32-inch LCD television, free Wi-Fi internet access and friendly service. Standard Double Room comes with a queen size bed and private bathroom. It offers a satellite flat-screen TV, DVD player, and minibar. Superior Double Room features a queen size bed and comes with private bathroom. It includes a satellite flat-screen TV, DVD player and minibar. Rate: THB 1620.00 ... THB 2100.00; select dates below to get current rates. Bathroom comes with a separate bathtub and shower. Spacious suite features a flat-screen cable/satellite TV and DVD player. It also has a minibar and safety deposit box. Free toiletries are included in an en suite bathroom. Located on a lower floor, this double room has a minibar, air conditioning and DVD player.